As we’re stuffing ourselves silly with food and chilling with friends & family today, here are all the (drama) things that we’re thankful for this year! Happy Thanksgiving, everyone! We hope that you’re all having a lovely and relaxing day that’s absolutely filled to the brim with delicious food and good times with your friends and family! On this day to give thanks and recognize all that we’re thankful for, we thought it’d be nice to have some lighthearted fun in naming the drama things that had us saying, “YAAASSS, thank goodness for that!” So, grab some (more) food, get comfy on the couch, and kick it with us for Thanksgiving, Drama for Real-style. Time travel that doesn’t require some weird space-time portal. If there was any year that really solidified my love for time-travel dramas, it’d be this one. My love/obsession with the kdrama, Signal, opened my eyes to the possibility of having characters cross through space and time without having to physically pass through a portal. This immediately makes the fantasy of the drama seem less gimmicky and more realistic. Clearly the dramaworld is also quite digging time travel right now with the recent Scarlet Heart kdrama remake and the new Jun Ji Hyun-Lee Min Ho Legend of the Blue Sea. I say, bring ’em on! A new drama “occupation” that’s never been seen before. There’s a running joke between my fellow HKdrama watchers and myself that TVB has used absolutely every occupation known to man as the basis for a drama. Although TVB has yet to come up with new one to shock me, Descendants of the Sun certainly did! I might not have been a fan of the drama itself (couldn’t make it past a few episodes…), but I certainly appreciated their use of the military as the occupational theme. The only times I’ve seen a military plotline used so extensively was in period pieces, never a modern one. Does it even matter that it was probably wildly inaccurate? Nah. Everyone’s watching it for Song Joong Ki anyways lol. The underdogs. Rooting for the misfit is practically a national pastime for us dramaworld citizens, so that’s nothing new. But this year in particular, most of the dramas and movies I watched featured characters that really embodied the beloved underdog role. From Shin Min A’s portrayal of overweight lawyer, Kang Joo Eun, in Oh My Venus to the eccentric upperclassman, Ah Tuo, played by Bruce Hung in Cafe.Waiting.Love, I somehow felt more joy than usual when they worked hard to lose weight or won over the girl with kindness. Underdogs will always win over the audience, but it’s great to see some characters that are fully developed on their own and not solely used in the romance plotline of their arc. 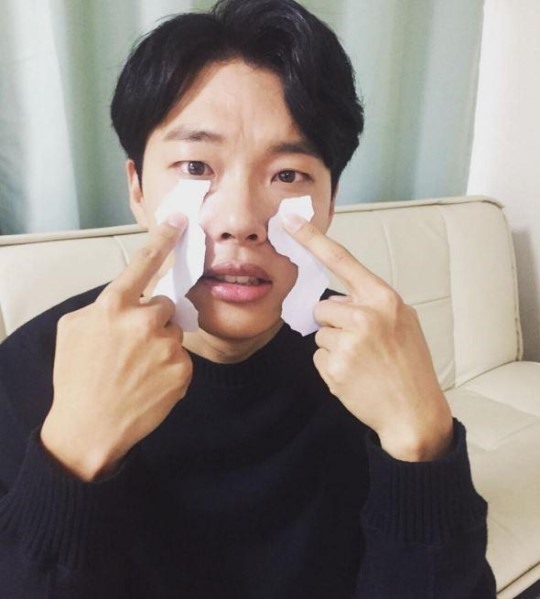 The return of Ryu Jun Yeol on small screen. Because he broke my heart in Reply 1988 (oops, spoiler alert!) and I needed to recover from it. He has yet charmed me again in Lucky Romance (it probably helps that Lee Soo Hyuk is in this – Hwang Jung Eum always has THE best guyfriend). Argh, he needs to be in more things because he is just such a good actor and needs to make more dramas. Chinese Running Man. Yes, it’s a variety show and it’s not new, but the hubs and I started watching it this year and he now knows a handful of Chinese celebrities. I’m proud, ’nuff said. Please let us know in the comments below what are some of the things you’re thankful for this year from your dramas! This list is just a fun way of highlighting some of the dramas we’ve watched and what we experienced and saw in them. But more importantly, we’re grateful that you, our readers, have continued to support us and our blog this year. Thank you for letting us share our drama experiences with you, no matter how serious or silly they are. We hope that you’re having a wonderful Thanksgiving and a very festive and happy holiday season! Happy Thanksgiving! 🙂 I’m thankful for Shopping King Louie and the sweet romance/friendship between Louie and Bok-shil. It made me feel warm and happy during a difficult time. Thank you King Louie.